Pesto is traditionally a mix of basil, garlic, pine nuts, olive oil and Parmesan cheese, but there's no need to stick to the basics! Try this delightful twist using garlic scapes and heart-healthy avocado oil. Lemon juice adds a zesty hit of acidity to brighten the creamy sauce. The result is a light, bright, and tangy pesto that's perfect spread on pizza, drizzled over steaks, or tossed with pasta. Garlic scapes are the slightly sweet, mild stalks growing from the garlic cloves. They taste similar to chives, but with an unmistakable garlic flavor. Take advantage of the short time when garlic scapes are in season and whip up a few batches. You can store it in the freezer fo enjoy long after spring has past. If you can't find garlic scapes, use 3 cups packed arugula and add 3 garlic cloves to the recipe. Per Serving: 109 calories; 12g fat; 0.9g carbohydrates; 1g protein; 2mg cholesterol; 86mg sodium. Everyone should use garlic scapes in their pesto! Combined with the avocado oil this pesto is a total winner. I used it on steaks, burgers, pizzas, and in pasta (all from just one recipe!). I even brought it camping and used it on our vegetable packets we cooked over the fire! Everyone at the campout was raving. I was the camping hero! Garlic scapes taste just like garlic, and were perfect in this pesto! 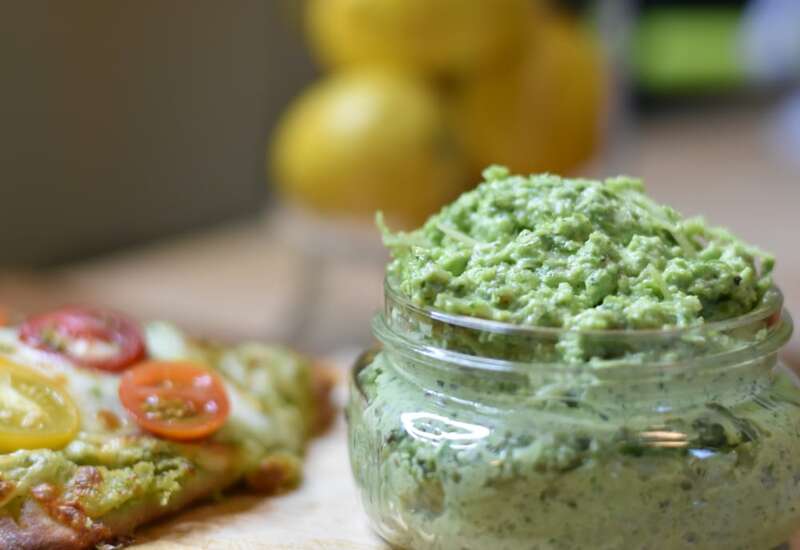 The added pine nuts, basil, and lemon gave this delicious pesto a true to taste flavor and texture. It's especially delicious on flatbread, which is how we served it. I can't wait to make it again soon.